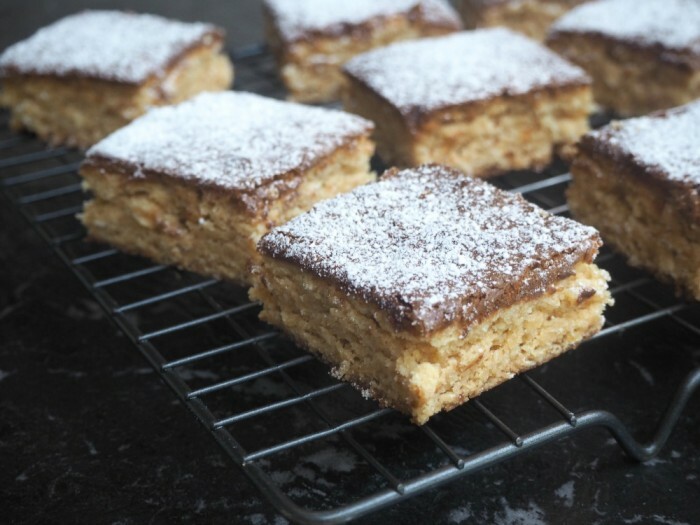 There are so many reasons to love Blondies and not just because it’s a teatime treat to match my hair! 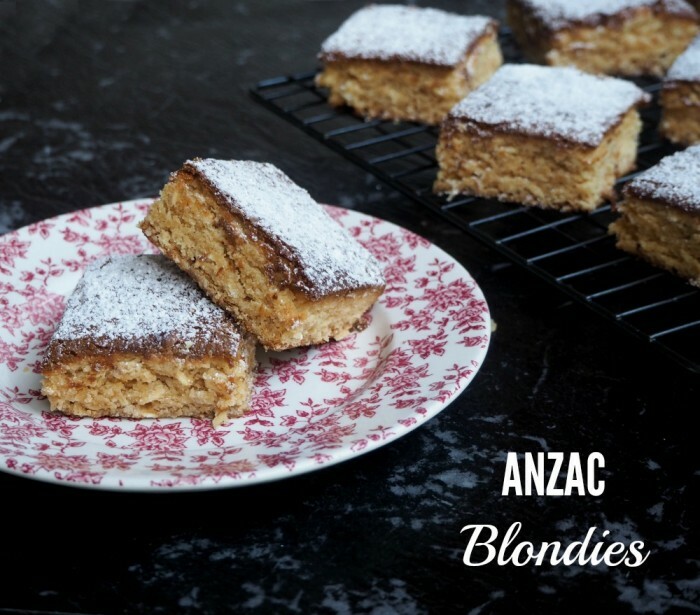 Blondies are white chocolate’s answer to a Brownie and this version is a delicious twist on the good old ANZAC biscuit. 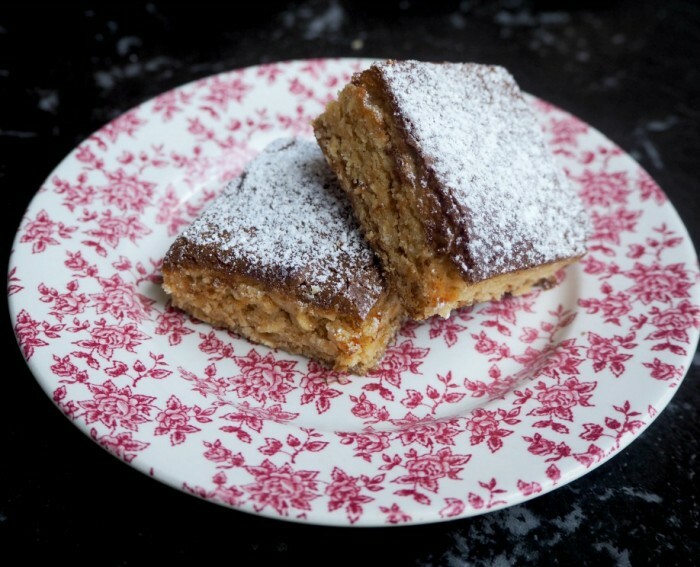 If a blondie and an ANZAC cookie had a cake baby, this would be it! Not only are these delicious but they’re freezer friendly too! I’ve updated the recipe to include both the traditional method and the Thermomix conversion! Preheat oven to 180 C / 160C fan-forced Grease and line the base and sides of a 20cm x 30cm lamington pan with baking paper, extending the paper over the long sides for handles. Melt the chocolate and butter in a medium pan on low heat, stirring with a metal spoon until just combined. Remove the pan from heat and cool slightly. Stir sugar, vanilla, golden syrup and egg into the butter mixture until combined. Sift in flour and baking powder. Stir in oats and coconut until just combined. Spoon into prepared pan and smooth surface. Bake for about 30-35 minutes or until firm to the touch. Remove from oven. Cool the slice completely in the pan. Dust with icing sugar and then cut into pieces to serve. Mill raw sugar to caster sugar for 7 seconds on speed 9. Set aside. Melt the chocolate and butter in TM bowl for 3 minutes at 60 degrees on speed 2. Add the sugar and mix for 30 seconds on speed 2. Add the eggs, vanilla and golden syrup and mix for 2o seconds on speed 2. Add the flour and baking powder and mix foe 30 seconds on speed 4. Add the oats and coconut and combine for 10 seconds on reverse speed 3. Spoon into the prepared pan and smooth surface.